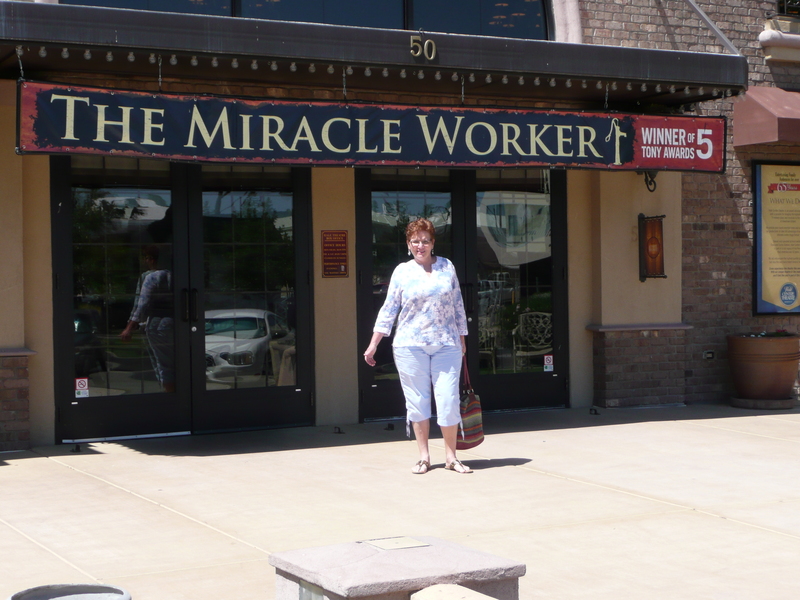 I could never have imagined back then, how that film, The Miracle Worker, would play out in a very similar fashion later in my own life. How could I have known that one day I would become the mother of a child, our daughter, Shantel, who would lose both her eyes to cancer, leaving her totally blind for life? Thankfully Shantel is not deaf, but she did lose a significant amount of her hearing, in both ears, due to the chemo she received for the treatment of the cancer. I remember like it was yesterday, the soul piercing fear I felt, when my husband, Bill, and I were told the only way to save our then two-year old daughter, Shantel’s, life was to remove both her eyes. What do you do with that? How do you cope? How do you find the strength to help your child find her way through life in total darkness? Shantel was the youngest child ever, at the time, in the FBC program to learn to use a long cane. We were told that most children under 4 yrs old do not have the muscle control and strength to control the cane in such a way that will keep them safe… Shantel has always been tall for her age and she has always been very strong. This is a picture of her walking with two of her friends in her class at the FBC. 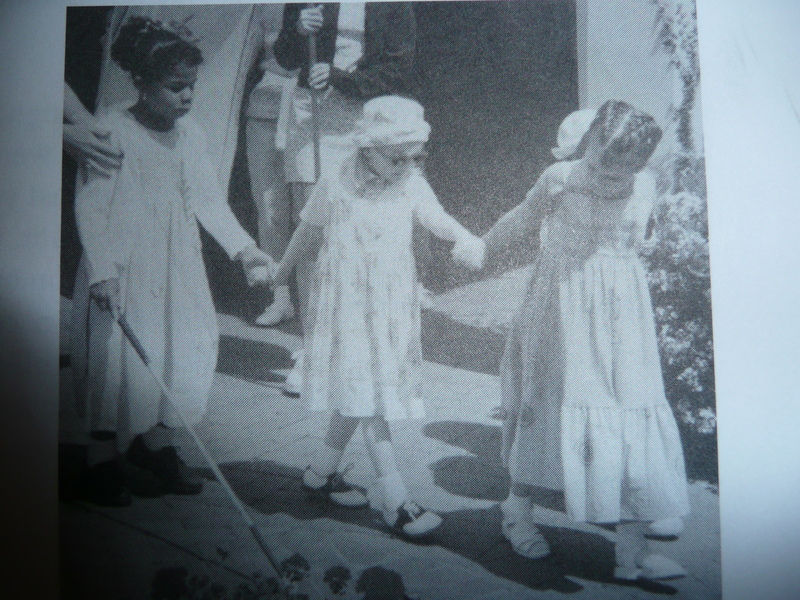 The little girl in the front and the one in the middle had very low vision at the time and both lost all their vision a few years later. Shantel, in the back of the line, of course was totally blind but commanded control of her long cane. We were and still are so very proud of her. 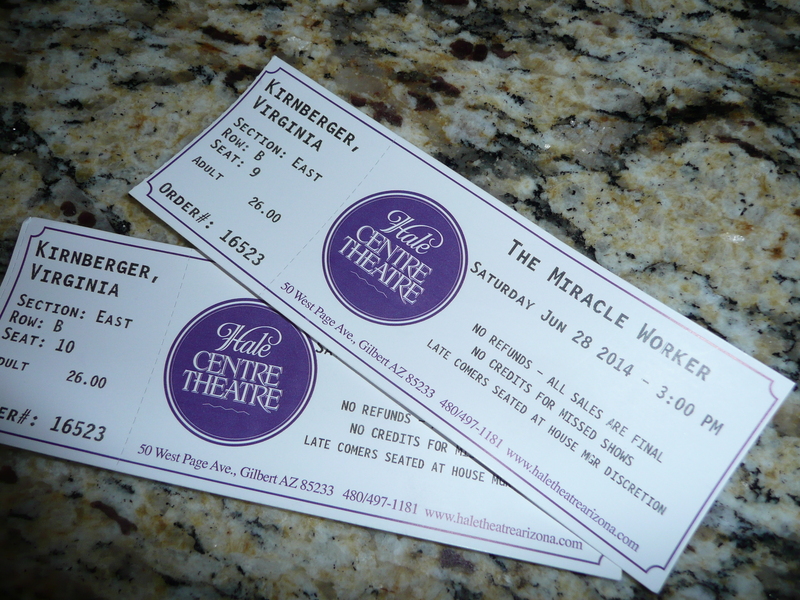 Yesterday, my husband, Bill and I went to a live play of The Miracle Worker. 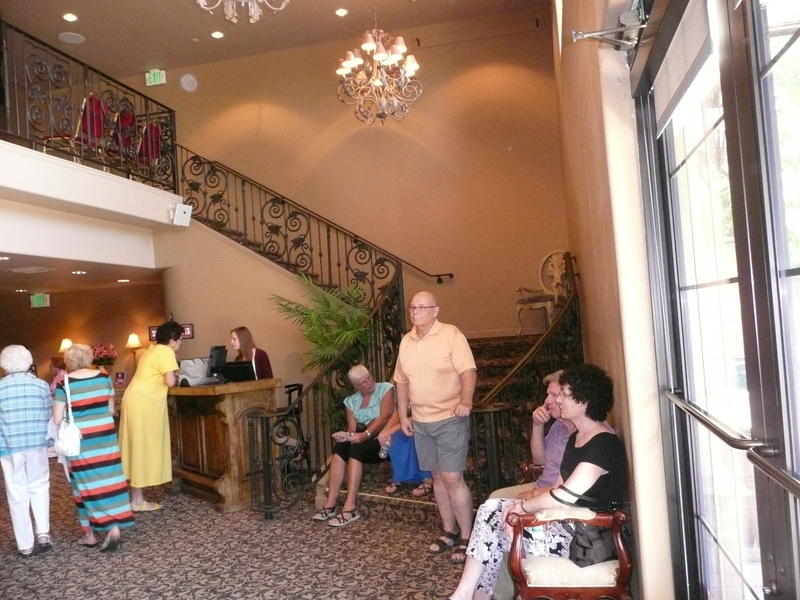 The performance was held at the Hale Centre Theatre in Gilbert Az. 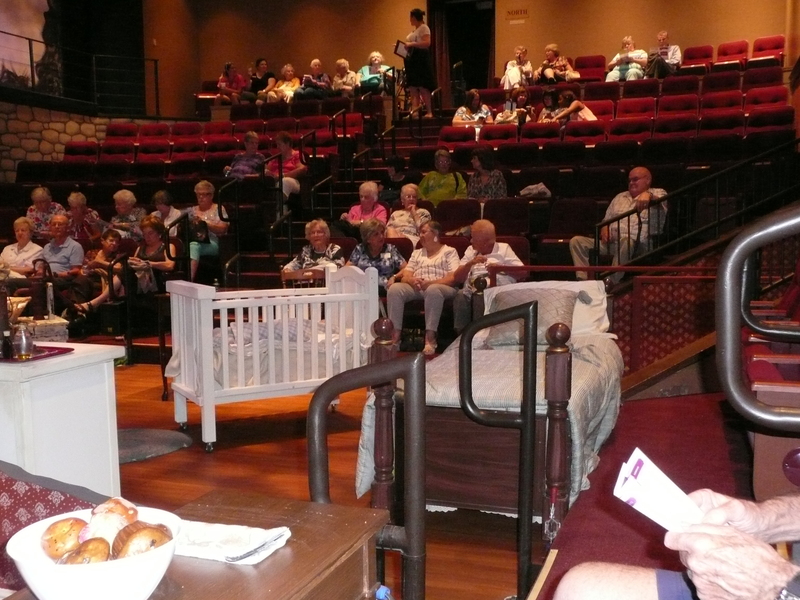 The Hale Centre Theatre is a lovely, small, intimate, theatre that is practically in our own backyard. 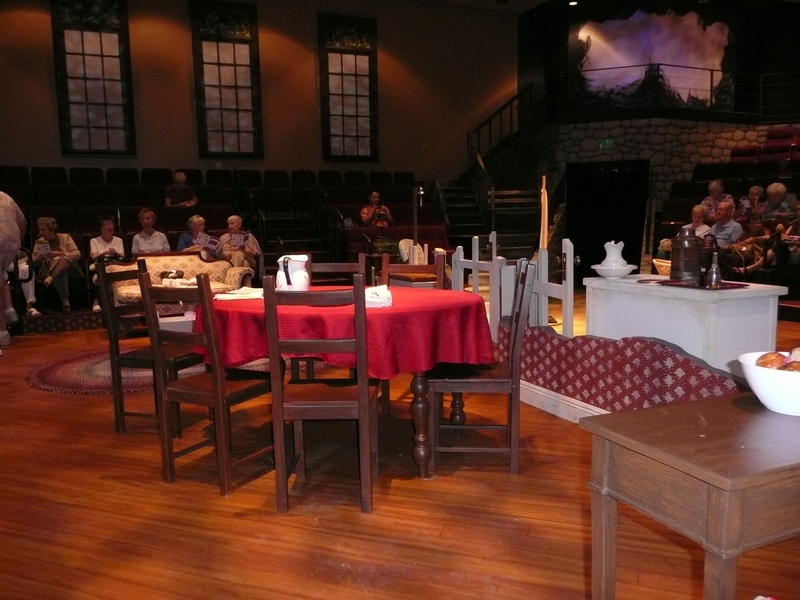 We had front row seats and could have reached out and touched the actors and stage props if we wanted… our seats were just behind the brown table with the white bowl sitting on it. How cool is that? 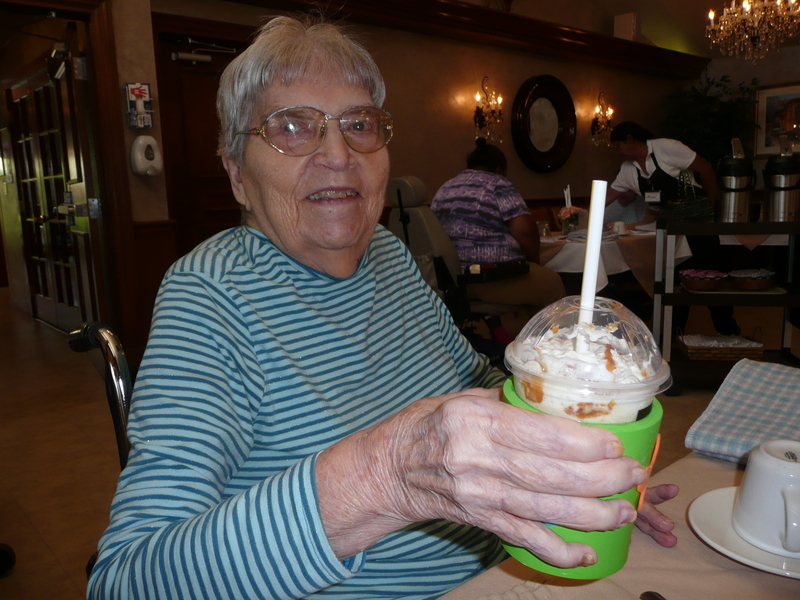 I went to visit my mother at the care center today and took her a caramel frappe, her favorite treat. Of course, like any other time when I bring mom a frappe, she usually doesn’t want to eat her lunch choosing instead to just have the frappe for lunch… I was able to convince her that she needed to at least eat some tomato soup that was on the menu and attempt to eat some of her chicken salad platter since she refused the roasted pork. During lunch, mom’s table mate, Joan, started talking about the upcoming 4th of July holiday. 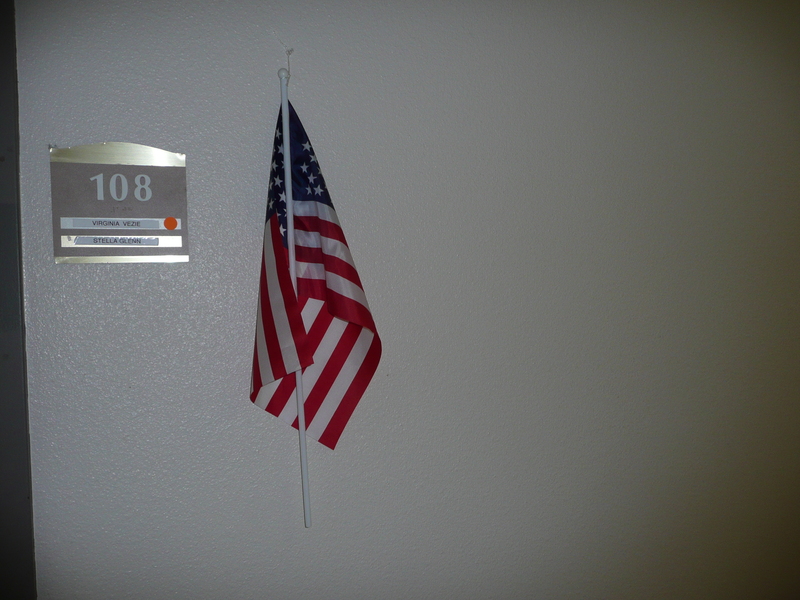 Joan said she has been asking for months for a small flag like my mother has on the wall outside her room. This is my mother’s flag. In typical Danny fashion…. seeing how he can’t do anything little…This is the flag Danny bought for Joan’s wall. 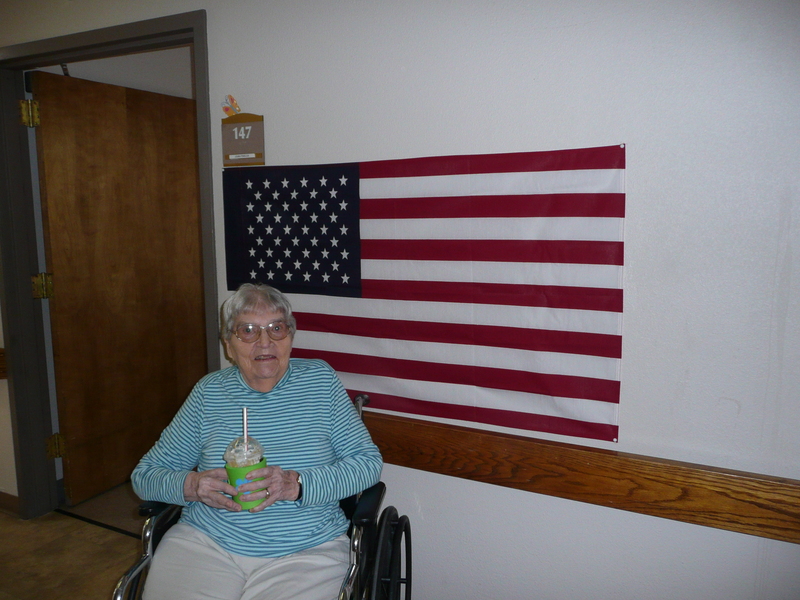 You can’t even imagine the ordeal this huge flag started between my mom, Joan, and even other residents within the care center… As Joan was telling me during lunch all about the big, beautiful flag my brother, Danny bought her… my mother got very quit, but I could tell she was not happy about Joan bragging about how big her flag was… or the fact that her own son, Danny, bought it for Joan… Joan went on to say “my flag is so big, one of the residents that lives across the hall from Joan insisted she count all the stars to be sure it was a real American flag.” Joan said she told that resident “of course it’s real, an ex-marine gave it to me, don’t you think he would know a real American flag from a fake..?” Joan said the flag was so big she had to have maintenance come down and hang it for her. They told her she could not have it on a pole, but they would hang it on the wall. Now, guess what my mother wants…? Shantel turned 21 on June 16th. About a month prior to her birthday she said she wanted to move out and try living on her own. Both Bill and I totally supported that decision because our whole goal as a family, as we raised Shantel, was to help her in every way, and anyway ,we could to one day live her own life, and realize her own dreams, independent of us. That said, I must say again that the day Shantel moved out of our home was one of the most difficult days of my life. I just could not imagine her not living here with us anymore. However, at the same time, I knew her decision was the absolute best thing for her, as well as us. And, I am so very proud of her determination and courage to not let her own fears stand in her way of achieving her ultimate goal of one day being completely independent. We are still in a transition period but everyday we get closer to our agreed upon goals. When I say we are still in transition, what I mean is, I do go over once a week and take Shantel to buy her groceries. She pays for the groceries, but I do drive her to the store. I also drive her to any doctor/dentist appointments etc. because most of her appointments would still require the dail-a-ride transfers from Phoenix dail-a-ride to East Valley dail-a-ride which sometimes leaves her waiting for hours… And, to be completely honest, I enjoy those once a week, in person, one-on-one, visits with Shantel. But to get back to the topic of this post “That Moment When…” Shantel calls me almost everyday and I love our chats, and I text her every night to say good night… During one of our conversations this past weekend, Shantel told me her friend, Jaz, came over Sunday, and took Shantel out to look around in some of Shantel’s favorite stores, then out to lunch… I was very happy to hear that Shantel is getting out of her apartment and spending time with friends… what came as a surprise to me was when Shantel actually asked me if I had plans for today (Monday) saying she would love it if just she and I could go to a movie and lunch!! Of course, I jumped on that… and I picked her up at 9:30 this morning for a 10:30 show of “Think Like A Man II” and then lunch. What a thrill it was to have my daughter actually ask me out on a mother/daughter outing.. I so enjoyed our time together, especially having an in-depth conversation with Shantel about recent events, and what is going on in her life right now… I so love that as an adult, she trusts me with her thoughts and feelings… That alone makes any and all hardships we faced as a family worth it all… Thank you and I LOVE you Shantel! My husband, Bill, and I recently saw the movie Heaven Is For Real, and I loved the picture of Jesus that the child in the movie said is what Jesus looked like when he visited Heaven and saw Jesus.. So, when I came home from the movie, I ordered this, Prince of Peace framed artwork, from the St. Jude Shop in Pennsylvania. 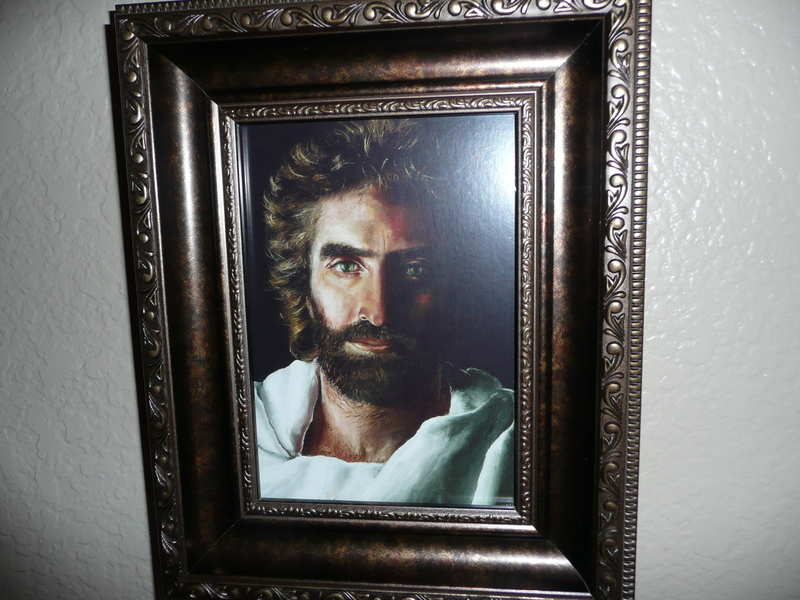 Not only do I love this picture of Jesus, but when I read the story behind the artist, Akiane Kramarik, an artistic child prodigy, artist and poet, who was only eight years old when she painted this Prince Of Peace work of art… I just had to have one for my home. When I placed the order for the artwork from the St. Jude Shop in Pennsylvania, I was informed of a five-day delivery time frame. After a week and a half, I sent an email to the name on the St. Jude Shop website asking if the order had been shipped but never received a response. I waited a few more days, then I called the number on the website and left a message asking for someone to call me back and let me know the status of my order. Three days later I finally received a return phone call from St. Jude Shop informing me that the artwork has been just flying off the shelves and they were working from a backlog but my order should ship within two more days and I could expect to receive the artwork within seven days. The woman thanked me for my patience and we hung up. Sure enough, seven days later my package arrived. I was so excited and could not wait to see the painting. I tore into the box and was immediately hit in the face with the most foul odor of rotting garbage. 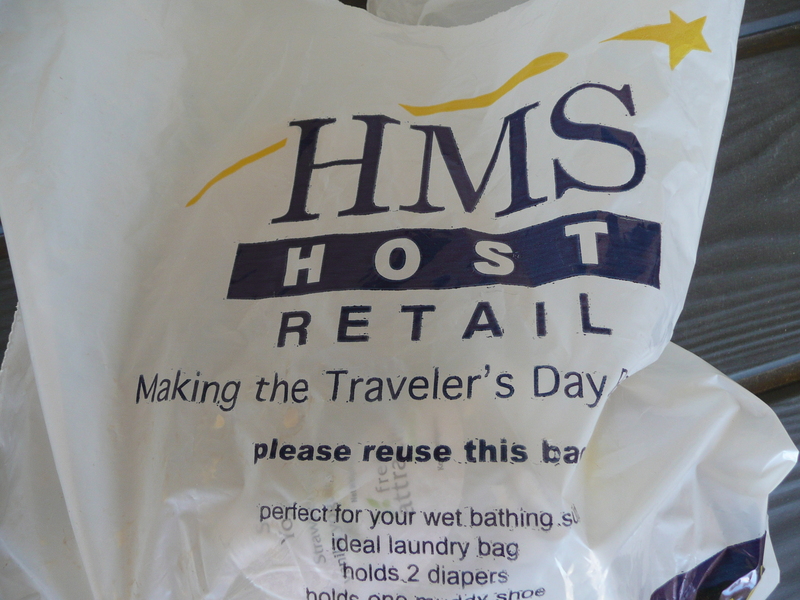 I couldn’t imagine where the odor was coming from so I picked through the packing material and sure enough, I actually found actual rotting garbage that was inside this bag that was used as part of the packing material. 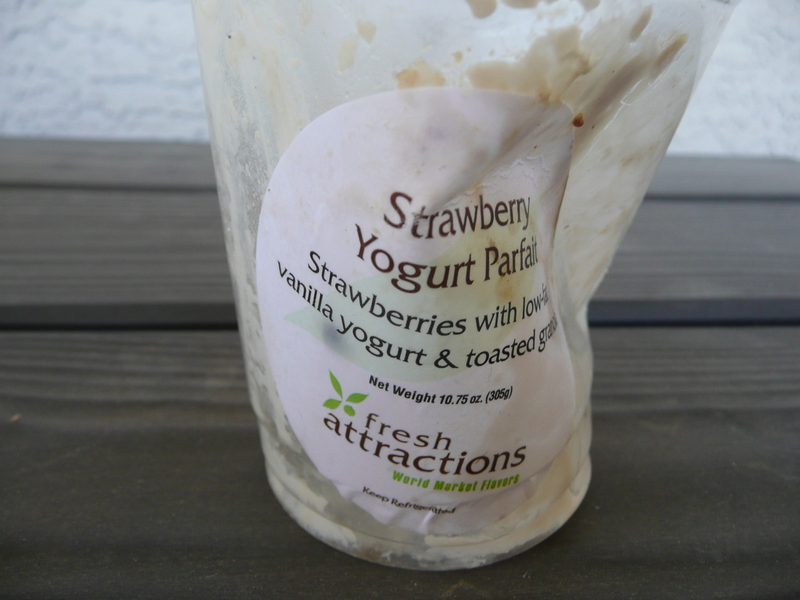 Inside the bag was what was left of a yogurt parfait. I can’t even begin to describe the foul odor, but just imagine this traveling from Pennsylvania to Arizona in the back of a UPS truck! 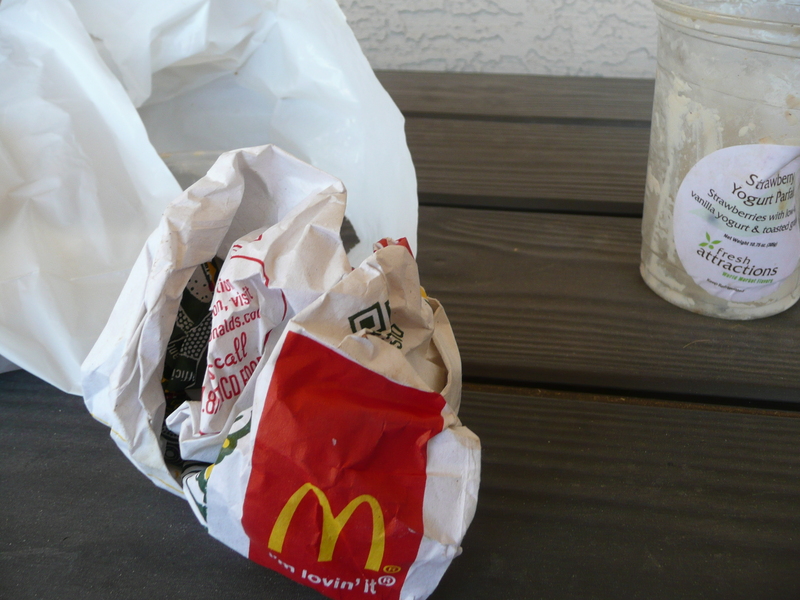 In addition to the rotting yogurt, I also found the remains of a McDonald’s lunch. I just could not believe anyone would do such a thing and I immediately took these pictures and sent them off to the email address on the St. Jude Shop website letting them know about the incident. I told them I was very happy with he artwork itself, but the way the package arrived at my home was not only a very unpleasant experience for me, it is also a very disrespectful way to handle, package, and ship the image of our Lord, Jesus Christ. I said I hoped they would take immediate action to speak to their shipping department about the proper way to handle, package, and ship the religious articles they sell. I also let left a testimony on their website as I just happened to receive an email from the St. Jude Shop the very next day asking me to provide testimony about the product/services I received. Imagine that! I let the St. Jude Shop know because of this incident, I will never do business with their company again. 1. Heat the oil in skilled. 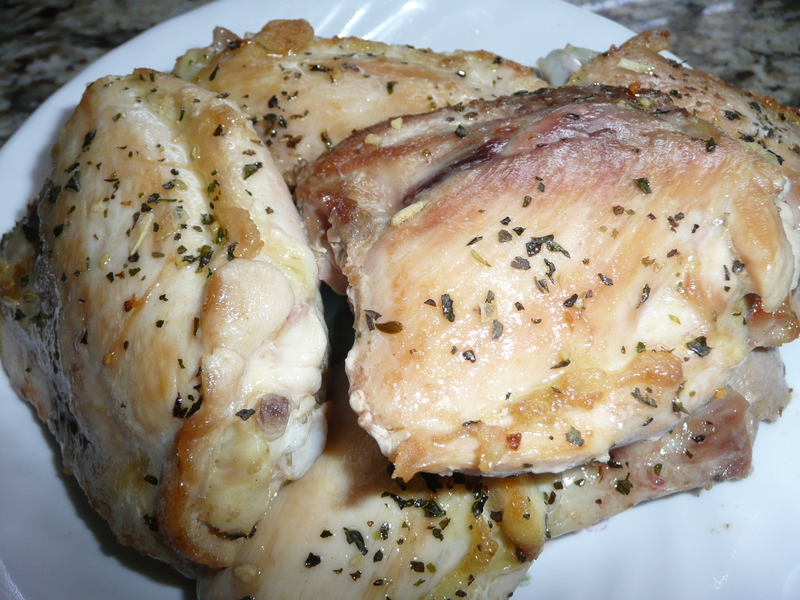 Add chicken; cook about four minutes on each side or until lightly browned. Remove chicken from pan and keep warm. 2. Add garlic to pan and sauté being careful to not let it burn. 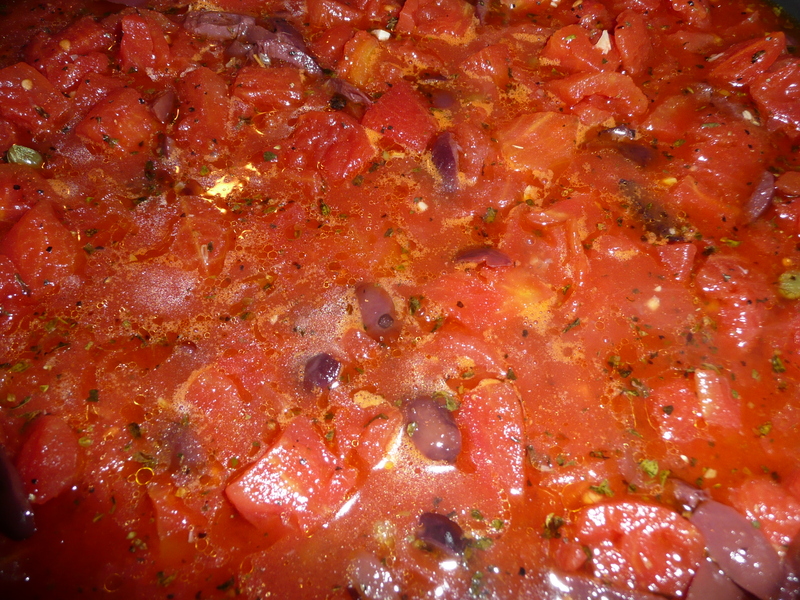 Add remaining ingredients; scrape pan to loosen brown bits. 3. Return chicken and accumulated juices to pan. 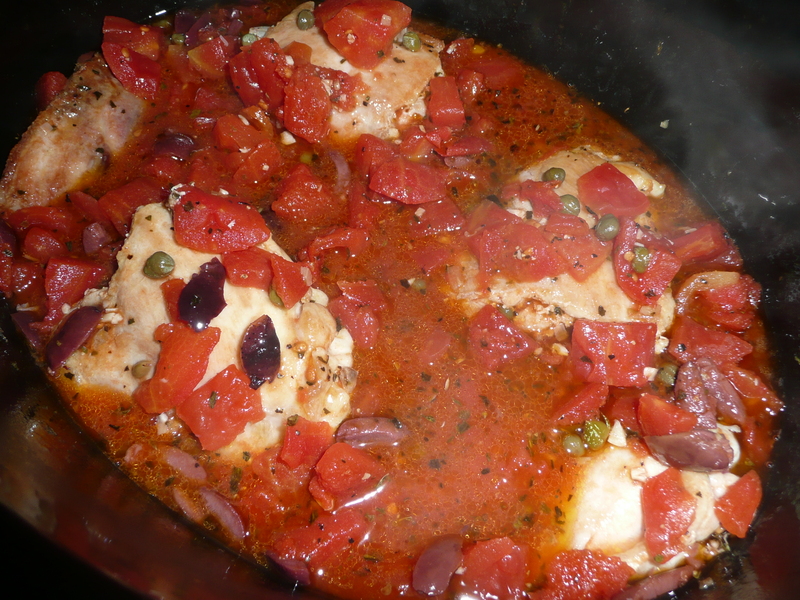 Reduce heat and simmer until chicken is done. At this point I transferred the chicken and sauce to my slow cooker and set it on low for a few hours then turned it to warm until we were ready to eat. 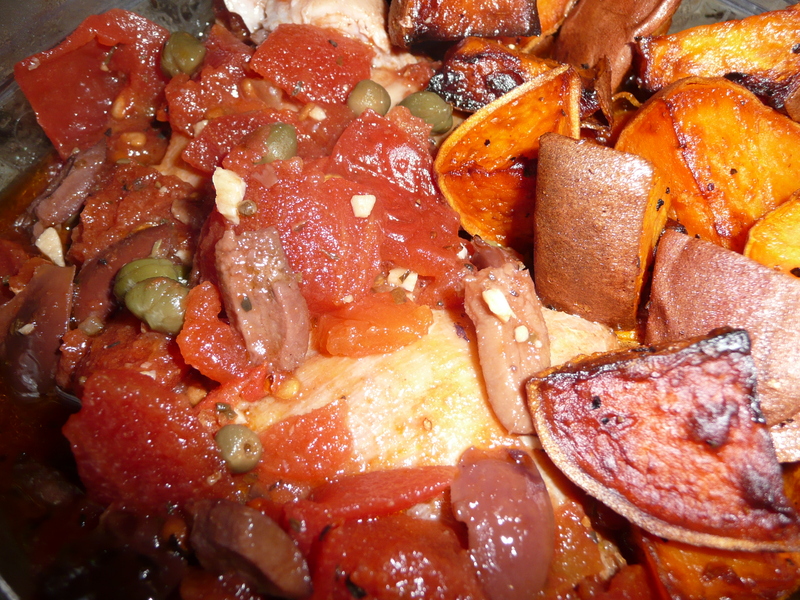 However, I have also made this entire dish in one Dutch oven on my stove. Delicious either way..
4. I usually serve this over rice, but this time I served it with a side of diced sweet potatoes that I lightly fried in canola oil. YUMMERS!!! When I went to visit my mother at the Care Center this week I was informed that two days before my visit, she tried to get out of bed by herself and fell on the floor. I asked why no one called to let me know about the incident which is usually their common practice? No one seemed to have an answer so I went on to see how my mother was doing. 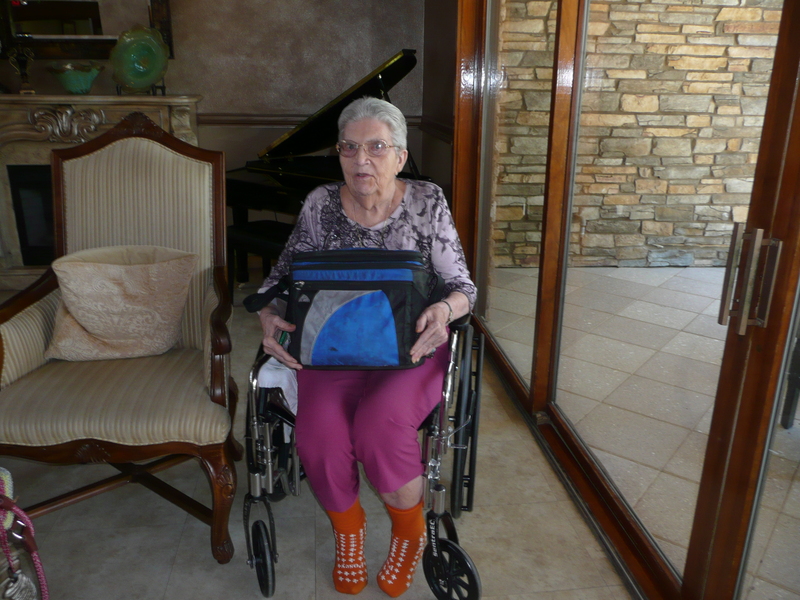 She was sitting in her wheelchair just outside her door looking very confused. I pushed her into her room and asked her why she tried to get out of her bed without help but she never really gave me an answer, she just started telling me something about she was in a big room with lots of people around and she fell… I asked her if she hurt anywhere and she said “my bottom hurts.” I asked her to lean forward as far as she could and I checked to see if she had any bruises on her back… but I couldn’t see anything. I went to the nurse and asked if anyone had ordered an ex-ray to determine if my mother had fractured anything when she fell out of her bed. No one had, so I requested that be done right away and told them I wanted to be called immediately when they had the results. I went back into my mother’s room and sat on her bed facing her and asked her if anything else had happened to her since I was there two days ago? Mom proceeded to tell me that her roommate had a male relative come to visit her and the roommate gave the relative mom’s bed for two days. I said “where did you sleep?” Mom told me she had to go sleep with the nurses at the nurses station… I asked mom how she finally got the roommates relative out of her bed and she said she didn’t know, he just finally left. I stayed and visited with my mother for a few hours then I went home with plans to check in on her again the following day. That night my brother, Danny, called me to tell me he hurt his back at work and would not be able to go visit our mother at the Care Center that following Sunday which is his usual visiting day. I told him not to worry about it, because I was going almost everyday now since mom fell out of bed, and hurts, and that she is very confused again… I told him I would go on Sunday as well and take mom some homemade cabbage rolls and have lunch with her, which I did. I packed a lunch box with a cabbage roll and black rice for both mom, and I, and I also took some fresh cantaloupe which mom always loves… When I entered mom’s room, I found her asleep in her bed. She had been up for breakfast, but told the nurses she wanted to go back to bed after breakfast. I found an aid and asked if she would please get my mother up and into her wheelchair because I brought lunch for her and needed to take her to the activity room so we could eat our lunch together while the other residents were in the dining room. Finally, mom was ready and off we went to enjoy our lunch together. I put everything back into the lunchbox and back to her room we went. In mom’s room, I asked her if she would like me to try to contact her sister, Katy, as mom hasn’t talked to Katy in a while. Mom said she would like that and I was able to get Katy on the phone. Mom talked for a few minutes then handed me the phone and said she wanted to go.. I let Katy know mom was done talking and said good-bye. I sat on mom’s bed facing mom and tried to talk to her about how she was feeling etc… she answered a few questions but seemed very distracted by every little noise in the hallway. I asked mom if she needed anything and she said she needed to go to the bathroom. I pushed the call button and asked the aid if she would help mom in the bathroom which she did. I spend a good deal of time with my mother, especially now that she isn’t feeling so well… My mother is eighty-six years old, and she tells me often she is very tired, and just wants to go be with my dad, her husband of 57 years, who died almost nine years ago… What can you say to that? Yesterday I shared that I had taken Shantel around town so she could take care of several errands from her “to do list.” I went on to share that before I left Shantel’s apartment that day, she asked me if I would mind taking her trash over to the dumpster across the apartment complex parking lot… Shantel told me the bags of trash were against the wall in her apartment and sure enough they were. I emptied her kitchen trash can and grabbed the three bags against the wall and off I went to the dumpster on my way to my car. Next day, Shantel called to ask me how many bags of trash I took out. When I told her four she said two of those bags were all of her jeans (lots of jeans) jackets (lots of jackets) and all her winter clothes… OOPS, my bad…!